his easy to read manual represents the combined 40-year experience of three avid Civil War relic hunters. This is a "How To" manual that can be used by both beginners and experts to find rural campsites. Presented are location methods including sources of information and organizations that can help you as well as basic topographic map and air photo interpretation skills. Included is an extensive list of Internet information sources. Examples are used throughout the manual. Methods and checklists are provided to be used on initial confirmation drives after prospect locations have been selected. When I was asked to review a book on researching Civil War campsites, I was not overly excited. I thought to myself "Oh great, another research book...this should be (yawn) interesting." I have read many research guides over the years, which have basically shared the same advice... "Go to the library... blah, blah, blah..." However, after the first page I realized that this was not an ordinary "how-to" book. It actually contains information that the relic hunter can use to further their research! Finding Civil War Campsites in Rural Areas takes a common-sense approach to narrowing down the location of Civil War sites. The authors explain that three important pieces of information are essential for successfully locating potential relic hotspots. These are: (1) The relic hunter must define the roads that were used by military forces during the American Civil War. (2) Sources of water (rivers, lakes, creeks or springs) must be sited along these routes and campsites, as water was required for both men and animals. (3) In order to zero in on the potential spot, the relic hunter must also be able to read the topography of the land at the sites designated by #1 and #2. Through the use of modem search engines and tools, the authors have also provided unique techniques to augment the research process. One of the search tools they recommend is Copernic, which has already proven to be beneficial to me as it provides high quality results from more than 90 search engines grouped into categories that can be sorted and stored for later use. Another section of the book discusses the proper procedures for overlaying modem aerial photos with Civil War-period maps, and using these with topographical maps in order to determine the location of the period roads in relation to the modem roads. Example photographs provide detailed step-by-step instructions on how to properly orient your maps with one another. While reading this section, I admit that I was amazed how much information can be obtained from examining an aerial photo! Once the search area has been reduced, you are now prepared to journey into the field for the next phase of your investigation. Again the authors have provided excellent descriptions and photographs of terrain features and cemeteries (tombstone design) in order to help confirm your hypothesis of a possible Civil War sites. Armed with all the information thus far gathered, you are now to the point where you are ready to "hit the woods, swinging that coil." However, before you do, the authors share tips of overcoming one more obstacle ...perhaps the most important of all: obtaining permission to hunt on private property. I personally know many diggers who cringe at the thought of approaching a total stranger to obtain permission to detect. However, not only is it the law, it is the responsible and courteous thing to do. Fear not, for tucked away in the latter part of the book are some very useful tips on accomplishing this much-dreaded task. With its detailed descriptions, tips, and useful advice, I feel that this book would be a benefit to any relic hunter's research library, and properly used, should lead to finding sites you only dreamed about. This is a great book, which is easy to read and understand. They use several images to make it even easier. The information they give is very detailed. Much of the information is available right on the Internet. I use a metal detector to hunt Civil War sites. I have been metal detecting for several years and I have found this book very useful. If you have any interest in finding Civil War sites or even finding old towns and places that you need to locate, this book will help you. From the experienced, to the novice you will get something out of this book. If you metal detect for anything old you must have this book. Thanks goes out to the authors of this great book! Finding Civil War Campsites contains some excellent information for the Civil War relic hunter (metal detecting), history buff or archaeologists, both professional and amateur, who pursues the often times elusive camp grounds used by both the US and CS Armies during the war years 1861-1865. Having been an avid Civil War detectorist and history buff for many years, I was pleasantly surprised at how useful the information was on every page. 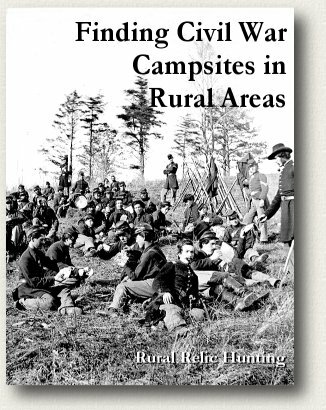 The Table of Contents breaks down into categories how to go about finding Civil War Camps, which in turn can lead to the discovery of picket posts, block houses (railway trestle guard camps and fortifications), bivouacs, conscription camps etc. Contained within its pages are excellent ways to use the Internet, aerial and topographical maps and their interpretation, Air photo info, principle guidelines (the basic rules of why and where camps were located), individual and organizational services that can assist you, using written documents, and a number of other good sources to help you locate a particular camp that no one has been able to find. It is well written in easy to understand terminology and contains some pictorial/graph/map examples to help you better understand particular topics. There is a section on gaining permission to search private property. Many times, I meet fellow Detectorists who have the desire but are not sure how to go about asking permission. This is a key element to gaining the land owners permission and you will want to use these tips and suggestions over and over again. The subject index makes looking up particular text a breeze. The authors have a combined 40 years of relic hunting experience, and whether your an Old Pro or a new beginner, I highly recommend this new publication. With relic collecting at an all time high, I suspect it will be the best $12.95 you'll ever spend! This summer when I started relic hunting for the first time, I found a likely spot based off some old CW maps but it was pretty far along in construction. However, I recently bought Dave's book on on finding rural CW camps. I relooked at the area using his techniques and realized I was about 500m off of where I was supposed to be. Anyway went out this weekend w/ high hopes since this area is undeveloped so far. However in the last 3 months, there has been some initial work which stripped away the area I wanted to hunt so I hit the edges and soon found a a small section of the old road in the woods! The area was had a moderate amount of old iron but i did manage to find a couple of things. I also was able to finally piece together the route of another old road and find a very promising site which I had been looking for for several months as it turns out a friend of mine actually rents an old farmhouse at the site, so I shouldnt have a prob getting permission from his landlord. Utilizing some of the techniques outlined in your book, I refined and narrowed down the search area to go investigate. To make a long story short, my partner and I drove over to the location, and after locating the owner and obtaining permission to hunt anywhere on his 360 acres..... the very first place I wanted to hunt..... a cow pasture with "camp traits"..... produced within 3 minutes of walking onto the site. My partner and I were digging 3-ringers at the same time. 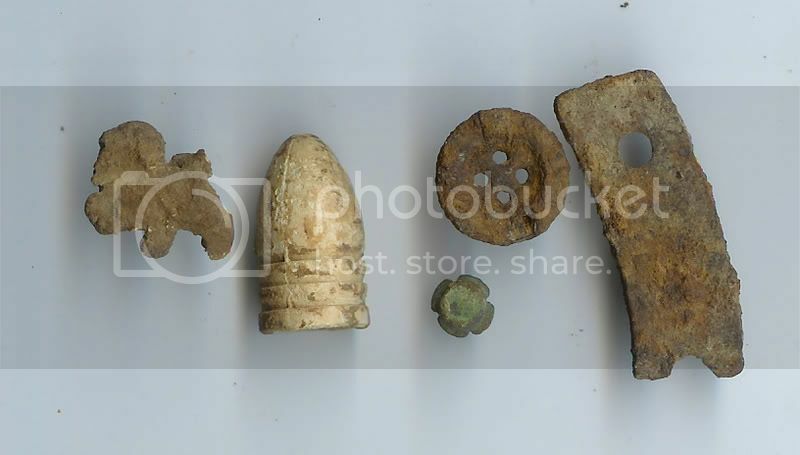 To date, we have recovered over 150 bullets, and about 50 buttons (all Yankee), along with other artifacts from camp life.